NEW FAIR TAX COULD CORRECT A LOT OF PROBLEMS « THE BRYCE IS RIGHT! I prepared my first IRS 1040 income tax form back when I was in my early 20’s, and it really hasn’t changed too much over the years. Back then, the form looked innocent enough, but the instruction booklet was a bit overwhelming. Nonetheless, I patiently persevered and was able to complete the form, deductions and all. It was quite an experience and I still prepare my own taxes to this day. Over the years I have tried tax preparation software, but frankly I didn’t see what it was saving me. Aside from accountants, the 1040 form is a labyrinth of head scratching instructions. If you study the tax tables closely, you can readily see how the more income you take in, the more taxes you have to pay. It’s no small wonder why people keep receipts and look for any type of deduction imaginable, regardless how minuscule it is. It is overtly complicated and casts a shadow of doubt as to its fairness. This is compounded by stories we hear whereby 50% of U.S. households pay no federal income tax whatsoever. This is probably why we dread the thought of April 15th, Tax Day. There have been alternatives proposed over the years, particularly the “Flat Tax” concept where everyone pays a single standard rate regardless of your economic standing. Although the concept is certainly “fair and equitable,” there are a lot of people who would find a way to avoid it based on some sort of exemption. More recently, the concept of a “Fair Tax” has been introduced and is currently being studied by Congress. 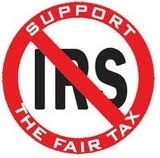 The first thing you have to understand about the “Fair Tax” is that it represents a complete replacement of the current tax system, meaning there would be no more payroll deductions, no more income taxes, no more deductions from pensions, all loopholes would be closed, no more IRS, thereby no more audits, and April 15th becomes a meaningless date in this country. Sounds great, right? Now here’s the catch; instead, revenues will be collected as an additional sales tax (or “consumption tax”), in other words, payable at checkout by EVERYONE (what could be more “fair and equitable”?). The “Fair Tax” is just that, FAIR, and could finally help us do away with the petty squabbling between classes as it is an equitable solution. The only people who will object to it are the makers of income tax preparation software, tax attorneys and accountants, and the IRS who will have to look for something else to do. To sign a petition in support of the Act, click HERE. Should this legislation pass, look for a flurry of sales activity on products just before the law goes into effect thereby avoiding the tax. Talk about stimulating the economy. Wow!